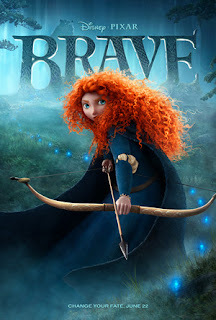 Brave is at once the most visually distinctive project Pixar has yet made and their most derivative work. Slightly dimmed as if filmed by natural light, the Celtic realm of stone and forest achieve a new level of realism for the studio's animation; even by their standards, I can think of no other Pixar film that invites such pure pleasure merely in scanning the frame for all its absurdly fine detail. Yet with this new peak of visual sophistication comes a story that mines Disney princess tales and blends it with the style and thematic content of Japanese animation maestro Hayao Miyazaki. But if this setup is less fundamentally "original" than, say, Ratatouille or Up, it nonetheless offers an important opportunity to alter and update a classic form of storytelling. After all, from old elements can come wonderful, new things. For the first act, at least, Brave demonstrates this in spades. Merida (Kelly Macdonald) instantly establishes herself as an entrancing heroine; the daughter of a king who presides over a group of allied Celtic clans (Billy Connolly), Merida is groomed by her mother, Elinor, (Emma Thompson) to behave like a proper lady but above all cherishes a bow given to her by her father. The precocious child grows up to be an adventurous teenager, strong-willed enough to climb a sheer cliff just because it's there and so skilled in archery that various targets she erects around the castle woods might as well be quivers for how many arrows they hold in their bullseyes. When Elinor announces that the day has finally come for Merida to choose a suitor, the young woman's outrage burns so hotly that the flippant faux-independence of some recent Disney princesses looks even more laughable. When she says she doesn't want to marry right now, she damn well means it, and she goes to unexpectedly drastic lengths to defy her mother's wishes. Amusingly, Brave portrays its men as brutish, immature fools. King Fergus' hall echoes with the drunken roars of loutish, bragging oafs, none louder than Fergus himself, affable as he is. The sons of clan leaders compete for Merida's hand, but they are all so dim-witted that whomever wins, it's clear that Merida loses. Their broad inanity relentlessly spoofs the idea of winning a lady's hand like a trophy, an idea I would say is self-evidently ridiculous at its most basic level were it not for an Entertainment Weekly article asking whether Merida might be a lesbian for such gender-role-bucking behavior. No, seriously. Because the men are so shallow and as unworthy of the audience's attention as Merida's, the film devotes most of its time to the conflict between Merida's headstrong behavior and Elinor's adherence to tradition. It is in this generational rift, more so even than Merida's uncompromising behavior, that ties Brave to the best work of Miyazaki. Brave has the intelligence and depth to sympathize with Merida, even to clearly side with her in the issue of betrothal. But that does not preclude the possibility, even the certainty, of her mother being right about many things and, if nothing else, the absolute, unshakeable love a mother has for her child. The delicacy of such a mature evaluation also carries over to the characterization of the disobedient child, and how fine a line can separate righteous indignation from bratty selfishness. This being a fantasy film, though, this moral is sold less through the striking energy exchanged between Macdonald's and Thompson's animated selves than a magical twist. Such an approach hardly breaks with centuries of fairy tale storytelling, but the plot upheaval here is played more for comedy than pathos. It's not so much a surreal outgrowth of the story so much as a sudden shift that develops the ideas of the first act with only intermittent success. The narrative curveball shatters everyone's arcs: Merida's emotional journey is instantly sidelined into a plot-driven quest, but one that makes irrelevant her foundation of self-sufficiency and strength. Those much-shown archery skills don't even play a role in the climax, or really any moment in the entire second half. Elinor is completely changed, preventing any serious engagement with her character. I wanted to get a sense of whether she walked into her own destined marriage happily or if she sacrificed her own dreams to follow the way of things. An offhand allusion to doubt is dropped at one point, but only as a quick joke that raises frustratingly unanswered questions. Brave, then, may be most engaging solely as a visual treat, but my God what a treat it is. I've not always warmed to Pixar's quest for realistic animation, feeling that somewhat missed the point of the entire artform. (As beautiful as Ratatouille's Parisian background is, I wish it tried to visualize the city's soul rather than recreate its appearance on Google Earth.) But the detail of Brave's druidic highlands is pristine to the point of tangibility: Scottish fog rolls in so thick it chills the theater with its mist, while the gorgeous but utilitarian stonemasonry of the castle genuinely gives the impression of having been handmade rather than programmed on a computer. Every Pixar builds technically on some specific aspect of a previous film: the reflective sheen of the Cars movies beget the sophistication, astonishing brightness of blazing fires in Toy Story 3 and Wall•E, for example. Here, the animation of Lotso the Bear's fur in Toy Story 3 appears to be the grounding technical element, for the hair and fur of Brave's characters and animals is so tactile I could often focus on nothing else. Whether it's the salt-'n-pepper grain flecking Fergus' steel wool hair and beard or the bristling fur of real, not toy, bears, the animation is breathtaking for its microscopic, almost incidental perfection. Then, of course, there's the case of Merida's curly locks, a feat of virtual gravity-defying the details of which read like NASA-level physical calculations. Yet it also seems indicative of the film's larger issues that I was often so entranced by the female protagonist's hair that I didn't immediately notice how quickly Brave ceases to develop the woman to whom those follicles are attached.